Babies receive a number of vaccinations in their early years to help protect them from a range of serious diseases. Here we look at which vaccinations are in the current schedule and the role immunisation plays. Vaccinations were developed to help prevent people from being affected by disease. Over the years, they’ve been honed and developed further and now the immunisation schedule in the UK incorporates a range of vaccinations that are given to babies and young children. The government, suggest that if a child isn’t immunised, they’ll be at risk of catching the disease and will have to rely on other people having immunised their children. Vaccinations work by stimulating the immune system in the way that the infections they’re protecting against would. The immune system then remembers this experience, even though its not had the full blown disease, and develops immunity to it for years to come. Most of the vaccinations are given in the form of injections and, each time a dose is administered, it’s over in a matter of seconds. Although babies inevitably don’t enjoy the pinprick, the experience is soon over and both parents and babies can relax again. Unless there are other medical issues involved, such as your baby being treated for cancer or being known to have a weak immune system, it’s recommended that all infants receive all the vaccinations. 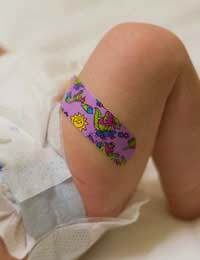 Babies in the UK receive numerous vaccines in their early years. The current schedule of vaccinations in the UK is as follows. At two months old, babies receive the first dose of the 5-in-1 injection. It consists of DtaP/IPV/HiB, which means diphtheria, tetanus, acellular pertusis, polio and Heamophilus influenzae type B. Also at two months old, they receive the first dose of PCV, or the Penumococcal conjugate vaccine. PCV helps prevent against conditions such as meningitis, septicaemia and pneumonia. At three months of age, they receive the second of the 5-in-1 DtaP/IPV/HiB injection, along with the first dose of Men C (meningococcus type C). Men C helps prevent against meningitis. At four months of age, your baby will receive the third dose of the 5-in-1 DtaP/IPV/HiB injection, the second dose of the Men C vaccine and the second dose of the PCV. At 12 months of age, your baby will receive a booster injection of the HiB/Men C vaccination.At about 13 months of age, it’s time for the first dose of the 3-in-1 MMR (mumps, measles and rubella) vaccination. Between the age of three years and four months and five months old, they’ll receive the booster of the MMR and a booster of the DtaP/IPV/HiB vaccinations. Not everyone is convinced that infants should receive so many vaccinations or that all of them are entirely necessary. The MMR scare, for example, raised concerns about vaccinations and raised the possibility that they could be linked to an increased risk of conditions such as autism and inflammatory bowel disease. The exact situation is still unclear, but if you are concerned, it is possible to obtain some of the vaccines individually on a private basis, to prevent your baby from having three or five in one go. The government takes the stand that all vaccinations are safe and won’t cause any harm to babies, but that’s an issue you need to make your mind up about.